An update to my Rabbit Bistro mini-review — less glowing, unfortunately — is here. I’ve decided to append review updates to the original posts, since most people find my reviews months later via Google ‘n’ such, and don’t necessarily see the updates. 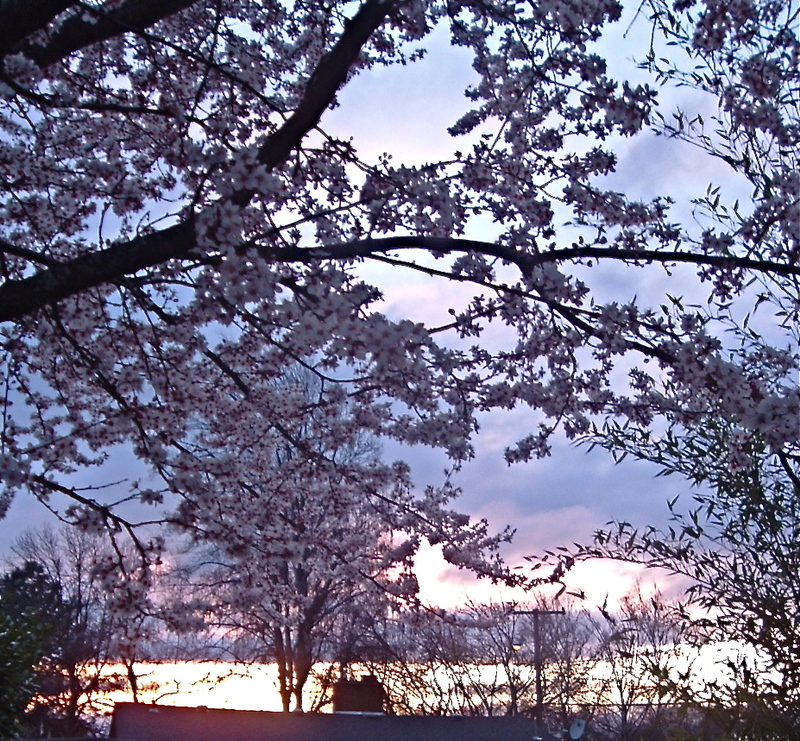 An early spring garden gallery for you. 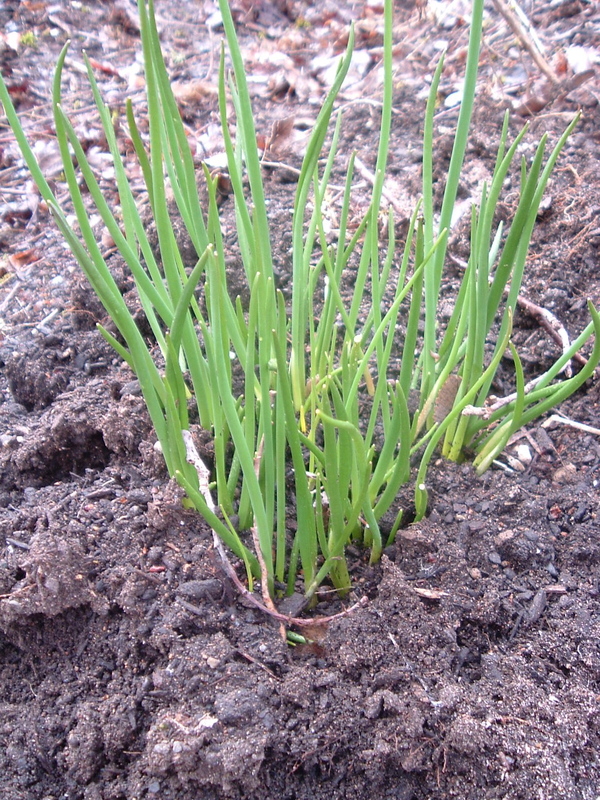 My chives among the allium have overwintered, and are starting to send up little chive flower stalks. 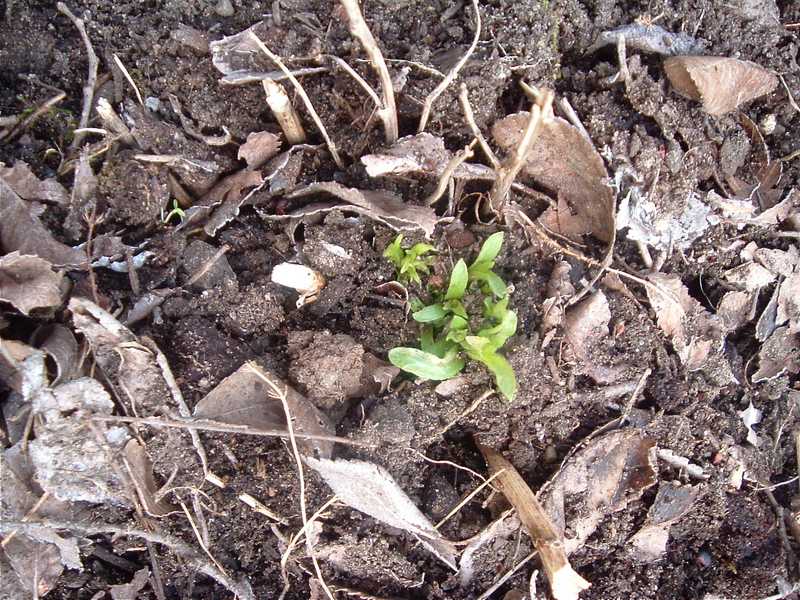 My magic tarragon made it through the winter, too. 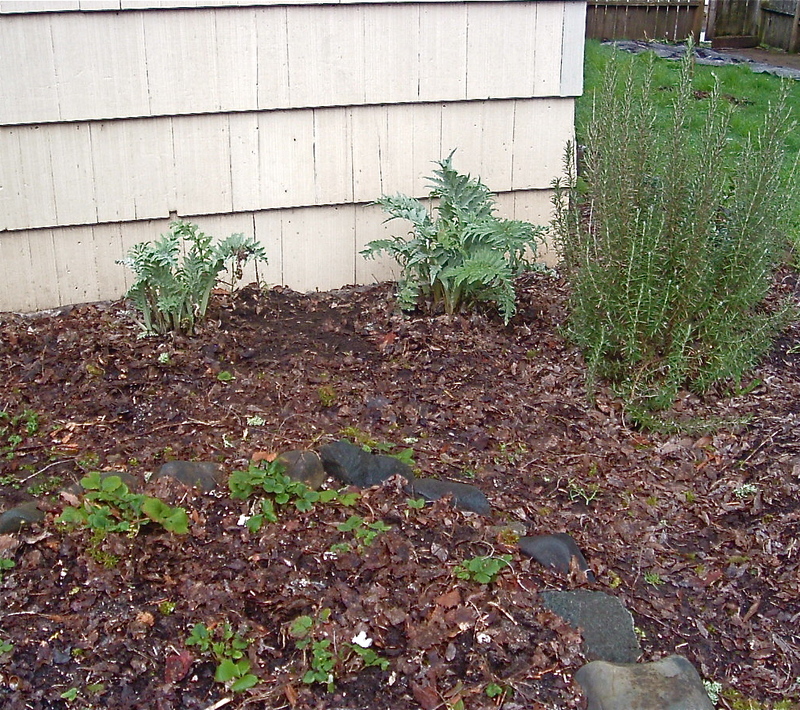 The artichokes were pretty much vaniquished by the snow, I thought, but they’re already back and going like gangbusters. The rosemary stands sentinel, and the strawberry patch regroups. 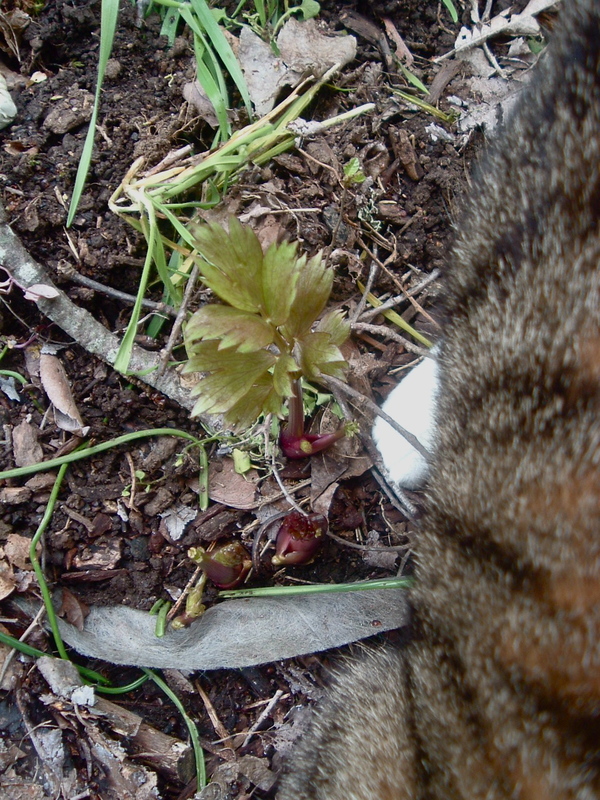 Kitty + lovage shoots next to the artichokes = kitty lovage. 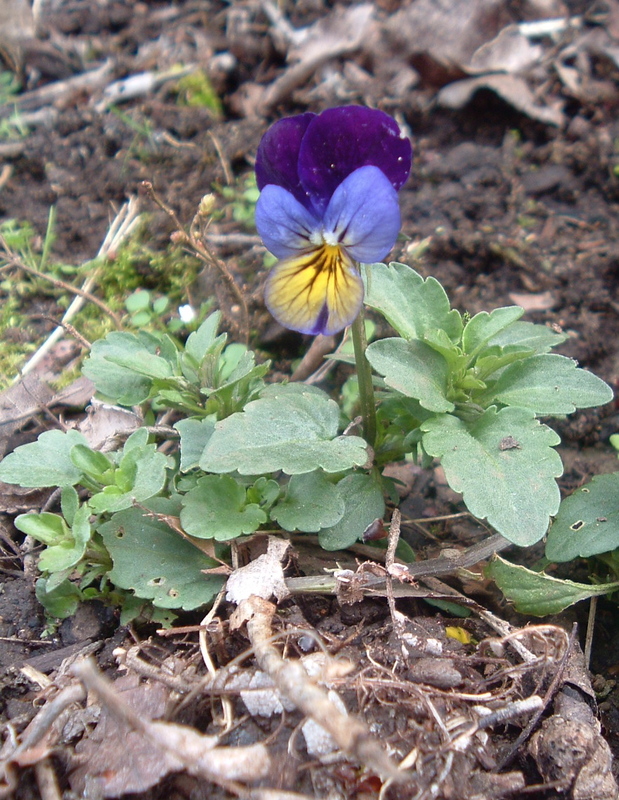 A wild pansy surveys the strawberry patch, thinking thoughts in French. To me, there is no more glorious sight than a big patch of dirt in March. 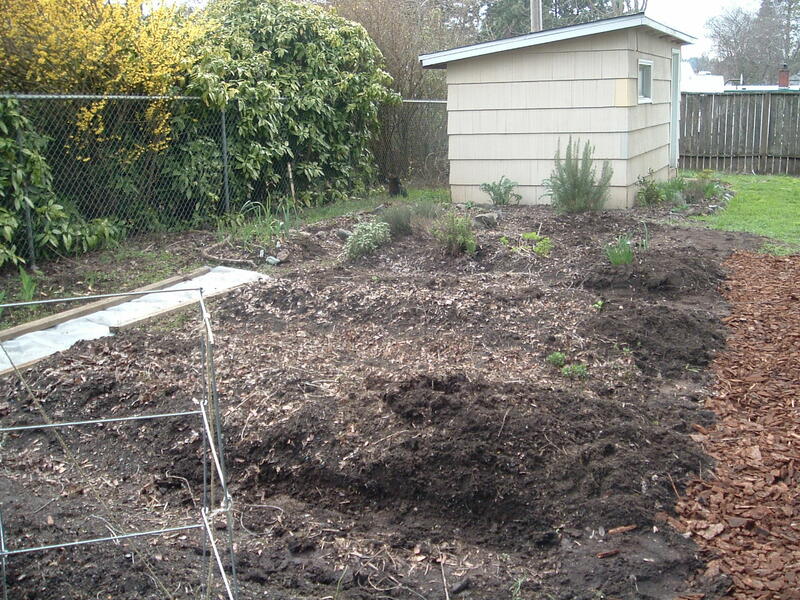 It’s not a great image, but you can see the rosemary and one artichoke immediately in front of the shed. Boris is the dark blotch to the left (where the lovage grows), and the herb garden, allium patch, and strawberry patch are in the rows closest to the shed. The dark areas of soil are where I built out the six rows another foot, and the woodchips mark my new path on the south side of the garden. The north side still needs woodchips for a similar path. The metal structure on the bottom left is part of my pea support. Behind the photographer (yours truly) is the potato and fennel row, and the cane berries (raspberries, blackcaps, and a new tayberry), and my little elderberry shrub. The shed hides my new rhubarb, a wormwood plant, and jerusalem artichokes. The gluten-free baking class (details to the right) with OSU Extension Master Food Preservers will be held next Saturday (April 4), not this Saturday, as printed today in the Register-Guard‘s Community Notes. The class will be held at Food for Lane County, and Diane Connell of the Eugene Gluten Intolerance Group will be answering questions and providing local resources. The class this Saturday (March 28)? That’s the candy-making class, at which you’ll learn to make a wide variety of yummy treats, including fudge, nut clusters, and marshmallows. This class will be held at the OSU Extension Building. Both classes are appropriate for beginners, and you can’t beat the price: thirty bucks. Also noteworthy: the City Club of Eugene forum this week will feature David Turner, Lynne Fessenden, and Douglas Frazer, individuals involved in our local food movement in different ways, discussing “Locavores: Eat Local/Be Happy.” David will discuss the history of local produce markets; Lynne (who heads up the Willamette Farm and Food Coalition) will talk about local food system rebuilding, and Douglas will talk about his experiences with Eugene Local Foods. You can attend the forum at the Downtown Athletic Club at 11:50 am on Friday (March 27) for $5, or listen to the broadcast on KLCC at 6:30 pm on the following Monday. What else is going on around town in the food universe? I’d love to hear what you’ve got. OK, so baffled by the reviews, we went to see for ourselves, and found The (Black) Rabbit Bistro on W. 29th charming and rather delicious, with great drinks. Can you believe it? You likely won’t until you go. I don’t have time for a proper review today, as I am engrossed in a host of unpleasant administrative tasks, editing, and woodchipping a garden path, but I felt obligated to share after my sourpussing about Rabbit’s reputation for bad juju the other day. We ended up staying a long time, sampling house-infused fig bourbon cocktails, flowery libations, and absinthey concoctions made by the bar manager, Amy, who is an absolute sweetheart. Her drink menu has a refreshingly unsweet profile, and she’s bold with flavor combinations. Her Manhattan, for example, has Navan in it, a French vanilla liqueur, and I had a drink with both lavender and lychee in it, and it actually tasted good. Holding back on the sugar and just letting the essences come through really goes a long way with this kind of experimentation. The chef (Gabriel Gil, formerly of Red Agave) doesn’t hold back, either. 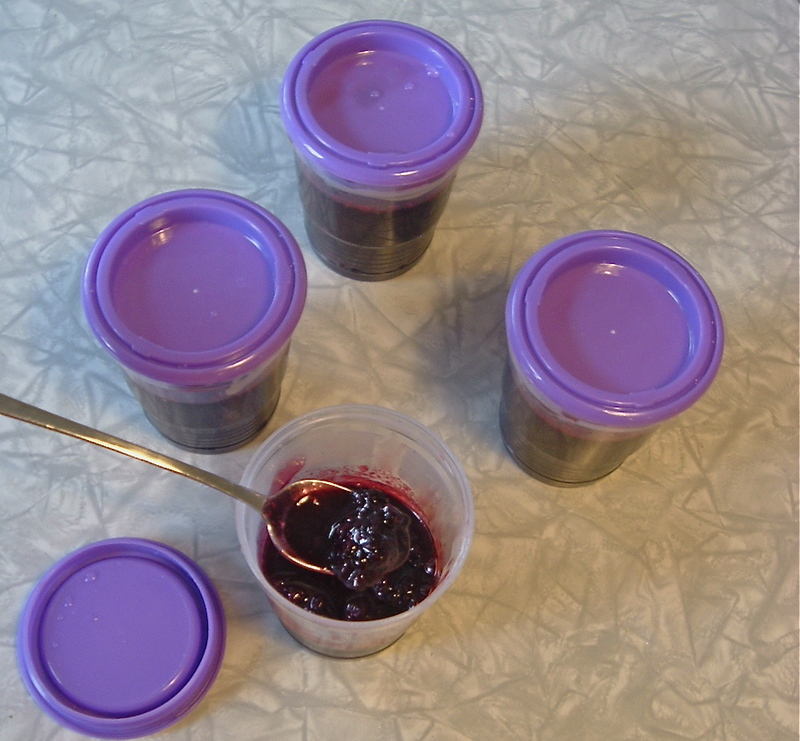 I had to ask about a handful of the ingredients or preparations, since they were unfamiliar to me. That’s probably the first time I’ve ever had to do that in Eugene. “Gnoki,” for example, is a French version of gnocchi, but it’s made with choux pastry instead of potato, so it really does merit its own name. Does this kind of specificity make the Rabbit snobby or pretentious? I can see why many people think it would. I don’t mind it, personally. I was intrigued by startling combinations like braised endive and grapefruit. Bitters, anyone? We both had a really hard time choosing what to order, since so many things looked so good. I didn’t meet the owners or chef, and had the very pleasurable experience of running into Scott, formerly of Bel Ami, who is now the bartender at the Rabbit on Amy’s days off (i.e., during the early part of the week). I didn’t see even a tiny speck of rudeness, arrogance, or anything negative whatsoever. In fact, I found the whole experience a thousand times better than I had expected. So what about the food? Well, I had an open-faced duck rillette sandwich with frisée and cornichons with frites, and my companion had comfort food: a chicken breast, mashed potatoes, and green beans. They were both excellent. We also sampled a hen-of-the-woods, asparagus, savory custard and poached egg salad: delicious. And we watched several more delights pass us by, like a whole trout served with its little head perched on top, frog legs fried in what looked like panko breadcrumbs, the infamous no-ketchup burger. The latter smelled good, really good, and that was after I ate. And we heard about the soup specials, which sounded like they were from an alien planet but both the bartenders swore up and down they were the best soups they had ever had. Prices are excellent for the quality of the dishes. Almost impossibly, Rabbit is cheaper than Belly, and a happy hour in the bar section in the back offers half price on a small set of appetizers (until the menu changes this week, your choice is frites, mussels, or frog legs) and $5 cocktails. That’s an Abe Lincoln for top-shelf cocktails. You can’t get that kind of deal anywhere. I need to go back again several times before I do a proper review, but I’ll tell ya what: I’m really looking forward to it. Her: Would you like to sit in the bar? My husband, not seeing a bar and not understanding: In the bar? Her: Yes, the bar. Because that’s what we’ve got right now. I happen to like the bartender, so sitting in the bar area (for the record, in the back of the restaurant) isn’t a huge problem, but the way this was handled was not exactly welcoming. Just a small change of tone would have made a huge difference. Her: We don’t have anything available in the dining area in front but there are some tables in the bar area. Would you like to sit there or wait for a table to open up? Us: The bar area is fine. And I enjoyed a strong Sazerac and sips of my friend’s Manhattan, infused with a subtle hint of vanilla. Didn’t care for the champagne cocktail with grapefruit juice as much, though. The food was quite good, especially the trout. This is Rabbit’s saving grace. All three of us had seafood. The dourade royale presentation was quite fussy, with two pieces of fish on a long platter and a dozen or so clams lined up in a row above the fish. My mussels were tasty, but I felt the bacon (which was cubed back bacon, not the fried stuff) and the thin slices of green beans did absolutely nothing for the sauce. And, to be even more cantankerous, allow me to complain about serving both fish dishes with a root vegetable purée, a texture combination that has always grossed me out. A cauliflower-fennel soup du jour was tasty, albeit light on the fennel. The asparagus/hen of the woods mushroom/poached egg salad we enjoyed the other day came in a portion so tiny the egg barely covered it — I was surprised by that. Probably my biggest negative was that it took forever for the food to arrive. Retrogrouch complained bitterly about the richness of the food, and my companion disliked the strip mall and multipurpose use room atmosphere afforded by same. It’s kind of unpleasant when you realize you have the best view in the place, and you’re sitting in the bar hinterlands, as far from the front door as possible, overlooking the back parking lot of Market of Choice. So there you have it. One pleasant experience, one not-so-pleasant experience at the Rabbit. Just keepin’ it real, hare. Sigh. Don’t forget about Happy Hour in the bar. The bar, because that’s what they’ve got right now. They’ve just switched over the HH specials to the liver cromequis (a fancy word for croquette), but have kept the fries and mussels. Rock bottom prices. $5 cocktails, half price appetizers. 4:30-6:30.
nacho average salsa: red pepper purée with corn! When I was an undergraduate in Berkeley, I’d almost exclusively shop at the old Berkeley Bowl, showing up on an odd weekday or first thing in the morning on a weekend to avoid some of the foot traffic. One of the only prepared items I’d buy was a delicious, bright red, zingy corn salsa made by a local company that also (if I remember correctly) made tamales. They’d sample the salsas on a little table on the weekends. I’d buy a pint and a bag of corn chips, then rush home and devour half the container for lunch. So as I was mulling over my corn salsa possibilities, the remembrance of times past filled me with the holy recipe ghost, and it occurred to me that my decades of experimentation to recreate this salsa were misguided. I had never been able to capture the texture and slightly bitter flavor of the red pepper purée. But lo! I had a jar of ajvar in the ‘fridge, and my long struggles were over. This summer, I’m planning to make my own ajvar, but until then, I use the stuff in a jar, available at any Middle Eastern grocery store and many plain ol’ American ones, too. In Orange County, I could buy it at the Safeway, but I’m not so sure about Eugene. They’d probably have it at Market of Choice. 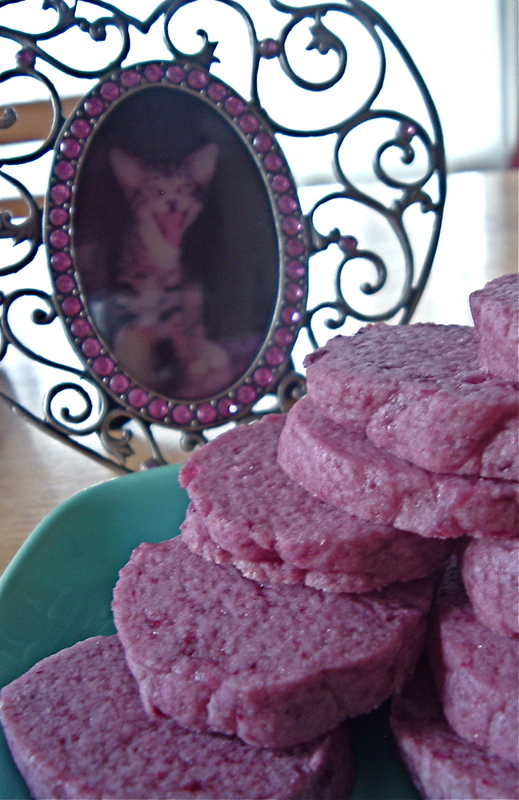 It’s bright red and fortified with vegetables, such as carrots and onions and eggplants. The eggplants are the key: they lend the smoky bitterness to the spread that I had been missing when I tried to recreate the corn salsa from Berkeley Bowl. Did the original recipe use ajvar? Hard to tell, but it sure tastes like it. In any case, the salsa is easy, pretty, and vegetable-y. More importantly, it uses up your freezer corn. Enjoy. 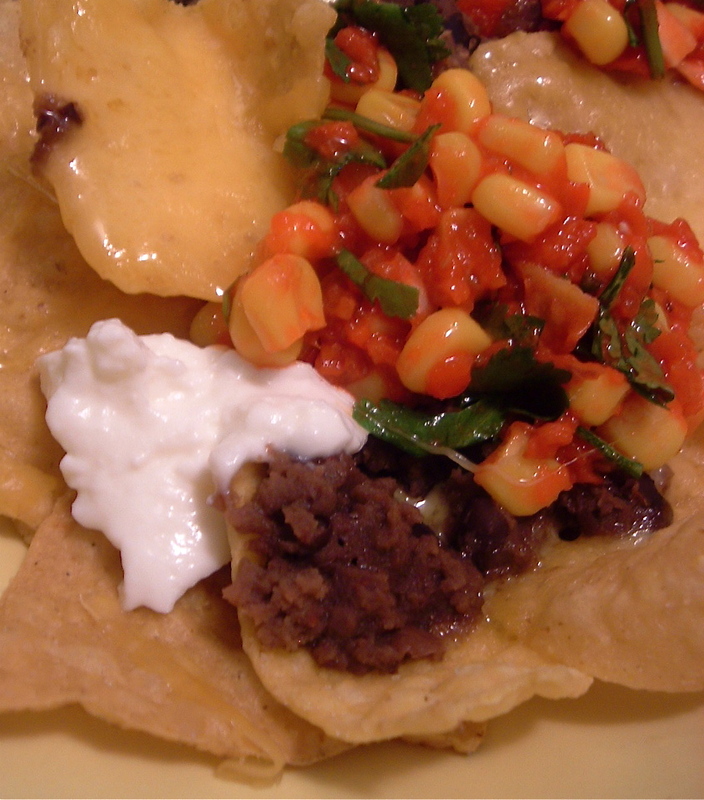 Mix all ingredients together and let sit in the refrigerator until corn defrosts and the corny juice blends with the flavors in the salsa. 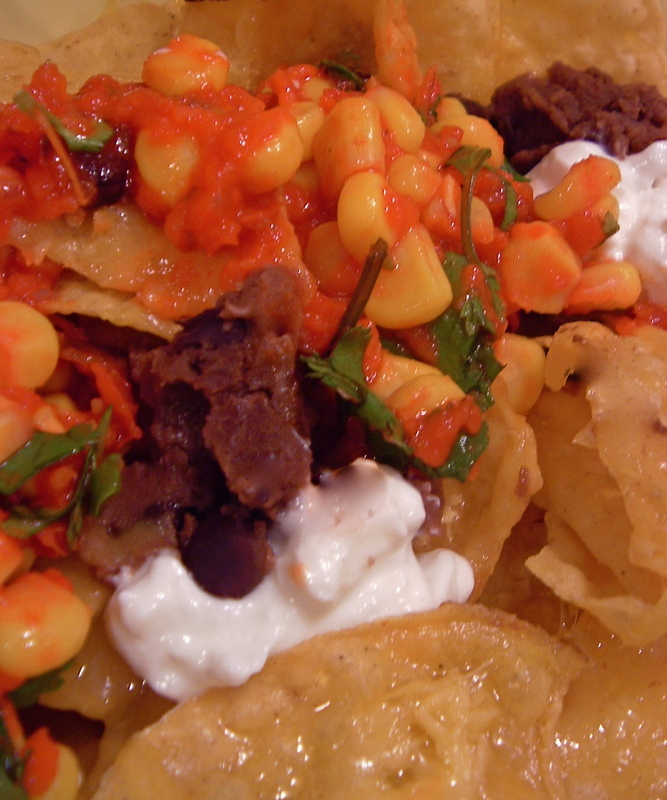 Serves as an all-in-one nacho topping, quesadilla insert, or taco fiesta.